Not too long to come, Terry will get to carry his first school bag and go to kindergarten, be alone at the school everyday for the good 3 hours. To get him more prepare for the study environment, lately I went to shop for some pre-schooler's books, so that he got the idea of what a writing and activities books like, which is different from the story books or objects book that he is reading now. I got the tracing, alphabets and numbers writing book from Popular Bookstore. Last Saturday, Mummy Moon saw road banner on MPH book fair at IMU College and invited me to go along. It is just 3 minutes drive away from my place. It held from 24 Oct - 1 Nov 2009, 10am to 8pm @ Ground Floor, Annex Block. This fair is also open to the public. They are offering discount up to 50%. Lots of pre-school’s book and cartoon VCDs on sales and value buy. Here are what I grab, total spend RM42. Mummy Moon eyes so sharp. :P Wow..you bought so many books. Actually these books are good for kids to learn writing and colouring. Gwen enjoys tracing and colouring very much. How come MPH does not have sales here! so many books you have bought.it will be good practice for Terry. You bought so many books..
wow, it's really cheap wor... the sales still on? Nice books ! Hope your boy will get some good practice on these books before he goes to his kindy. my kid also has the same numbering book in first photo. he only likes to write number 1, coz the easiest. the floor puzzle looks great, cheap somemore..
hope terry loves all the stuffs! Drop by from myLot. Enjoy reading your post. Wish you a wonderful trip! Wah so many nice books. 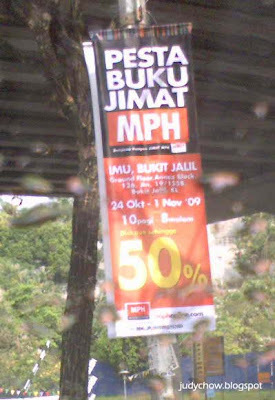 We love to go to this MPH warehouse sales too!